These foams expand quickly to fill the largest of gaps. 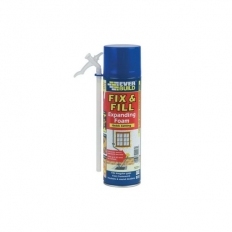 Expanding up to 50 times can contents, these foams are ideal for filling gaps around windows, doors, brickwork, etc. Once dry the foam can be sawn and sanded into shape and can then be plastered over or sealed for the final finish. Options available from Everbuild and Bond-It.